The cast at the Walang Hanggan Meet and Greet event. 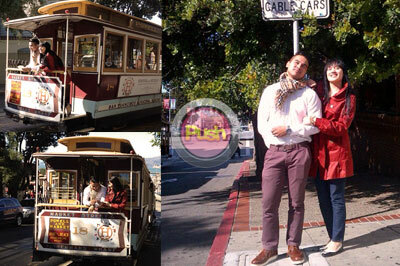 The stars of Walang Hanggan may be busy with their duties at the One Kapamilya Go celebration in San Francisco but they surely had fun in between takes and shows. Aside from meeting their supportive fans in the Bay Area and shooting some promotional scenes, Coco Martin, Julia Montes, Paolo Avelino, Melissa Ricks, Joem Bascon and Ms. Dawn Zulueta took the time to dine, play dress up and see some sights. (L-R) 'Mother' and 'son' enjoyung dinner; Paulo enjoying his BBQ; Goofing off for the cam. (L-R) Coco and Julia taking a breather; Checking out the monitor; Coco and Julia inspecting some 'love coins'. (L-R) Joem and Melissa enjoying a tram ride; Joem and Melissa basking in the sun. The beautiful ladies of Walang Hanggan. 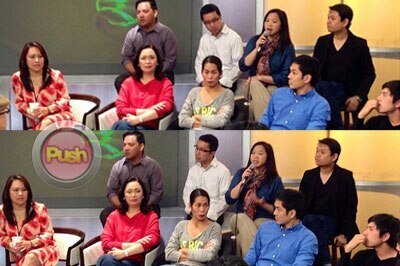 The Walang Hanggan cast at the One Kapamilya Go presscon. (L-R) The ever beautiful Ms. Dawn Zulueta and her fab boots; Melissa, Julia and Coco backstage at the One Kapamilya Go show. Walang Hanggan ladies with their escorts.